Come cheer on the TAP-Chicago Typhoon as we take on other Chicagoland teams at the Chicago International Dragon Boat Festival at beautiful Lake Arlington. After enjoying the race, we’ll get dinner at a local restaurant. Dragon boating with TAP-Chicago is great way to make new friends, get a workout, experience the thrill of competition, and thrive in a team environment. Paddling experience and athletic prowess are appreciated but not required. Spectators are welcome to cheer on the team and enjoy the festival in Lake Arlington. Come find us at our team tent with the big TAP-Chicago banner. 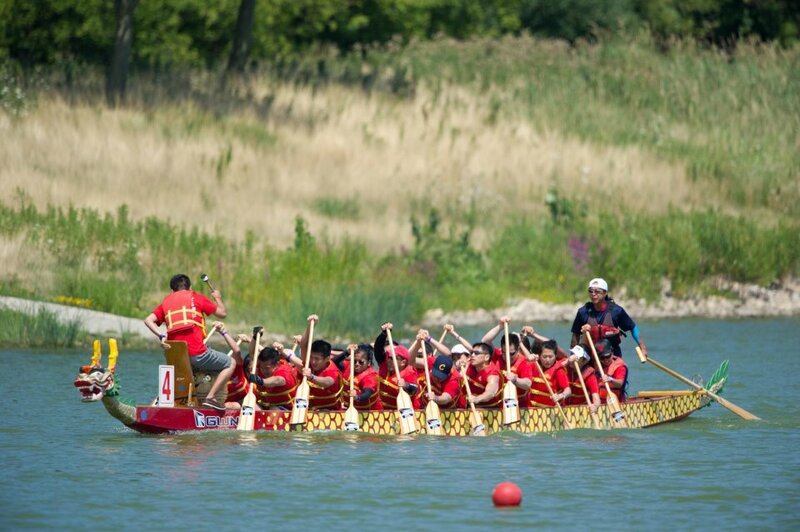 The 2015 TAP-Chicago Typhoon dragon boat team is sponsored by the Overseas Community Affairs Council of Taiwan, Cathay Pacific, Trust Air Cargo USA, and Ascene Chicago. Thank you for your generous support! The Chicago International Dragon Boat Festival returns to beautiful Lake Arlington on Saturday July 25, 2015. The event brings culture, sport and international flavors to Lake Arlington Park and blends a 2,500 year-old tradition with the fun and excitement of an outdoor festival. The festival will feature competition among teams from as far away as Florida and Canada along with participants from the Midwest. There will also be multicultural performances, games, and vendors. The festival is a wonderful time for spectators. Post in Athletics, Cultural, Past Events | permalink.